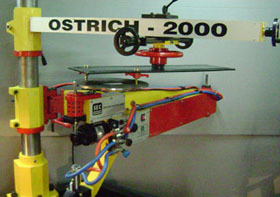 Ostrich 2000 is a Professional , Tough and Durable Profile Cutting Machine . This non tiring machine has to be foundation mounted and can be used in multiple shifts for large Production Application. A Magnetic Racing Roller which moves around a Tin Sheet Template makes the cutting Torch cut the exact shape with perfect accuracy. Ostrich 2000 can cut Mild Steel and Low Alloy Carbon Steel with Oxy Fuel the Machine can also be used for Plasma Application to cut Stainless Steel and Aluminium. The Machine can cut from 5mm to 250mm Plate thickness with Oxy Fuel and Plasma thickness depends on Power Source. The Machine can cut any complex shapes like Flanges , Stars , Hooks , Elipse , Triangles or even Circles , Squares , Rectangles and even Staright Lines. The Machine can cut any shape from 20mm dia to 2000mm square . The Machine runs on just single phase 230V power and consumes very less electricity. Ostrich 2000 can be supplied with Injector Mix or Nozzle Mix or Victor Compatible Torch. 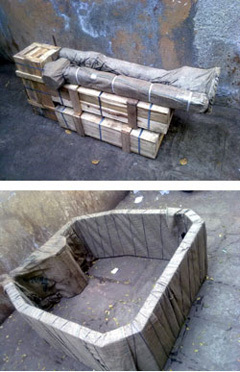 It can be supplied with Electro Magnet Tracing System or Permenant Magnet Tracing Head. The Machine is very popular in Indian Fabrication Industry and is used by small workshops to Large Ship Fabricators. and the warranty covers electrical components also. 1 Larger Cutting Capacity – Ostrich 2000 can cut any shape upto 2000mm x 2000mm area, Ostrich 1300 can cut only within 1300mm x 1300 mm area. 2 Larger Plate thickness Capacity – can cut up to 250 mm plate thickness, Ostrich 1300’s maximum plate thickness capacity is up to 200 mm only. 4 Ostrich 2000 Slide is longer than Ostrich 1300. 5 Ostrich 2000 slide screw is 25mm in diameter and Ostrich 1300 screw diameter is only 19mm. 6 Ostrich 2000 runs on 3 x 3 Ball Bearings while Ostrich 1300 works on 2 x 2 Ball Bearings. 7 Ostrich 2000 gives faster production because you don’t have to shift plate as frequently on Ostrich 2000 than on Ostrich 1300. Cutting Capacity Any shape from 20 mm to 2000mm dia. Ostrich 2000 Ist Main Hinge - 1 Set. Ostrich 2000 2nd Hinge - 1 set. Small Slide Unit - 1 No. Small Fixed Spanner - 1 No. Big Fixed Spanner - 1 Nos. Adjustable Spanner - 1 Nos. Nozzle Cleaner - 1 No. LN Key - 7 Nos. Torch Holder - 1 No. Template Bolt Unit - 4 Nos. Tracing Roller - 2 Nos. Nut Bolts Sets - 3 Nos. Locking Lever Set - 1 No. Machine Base - 1 Nos. Pillar Pipe - 1 No. CI Rings - 3 Nos. Pipe Mounting Unit - 1 No. Long Slide Mount Unit - 1 No.